Well known for his rich baritone voice and unique take on classic Americana, Bill Callahan has been a prolific artist over the years releasing 12 albums under the name Smog before shedding that to perform as Bill Callahan in 2007 and producing a further 5 albums. 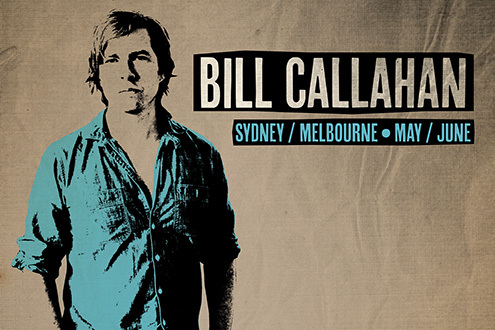 Last here in Australia for the 2015 Vivid Festival and a sold-out appearance at Melbourne’s iconic Hamer Hall, Callahan returns in 2017 for four more Vivid Sydney appearances and for an exclusive six show-three night residency at Melbourne venue Howler. Yep, you read that right; six shows at Howler, with early shows scheduled for a 7.00pm and late shows slated for 9.30pm. The intimate format – a stark contract to the grandeur of the 2015 visit – will feature a two piece setup with Callahan being joined by guitarist Matt Kinsey. And in a further twist on tradition support on all six Howler appearances will be Melbourne comedian David Quirk. Don’t miss these unique, intimate Australia exclusive shows this May / June. Tickets For Howler on-sale Friday 31st March. Tickets for Vivid Sydney on-sale now.